ESPO is delighted to congratulate the Port of Barcelona (Spain), Port Authority of Melilla (Spain), Niedersachsen Ports Emden (Germany), Shannon Foynes Ports Company (Ireland) and Shoreham Port Authority (UK) for achieving PERS certification. 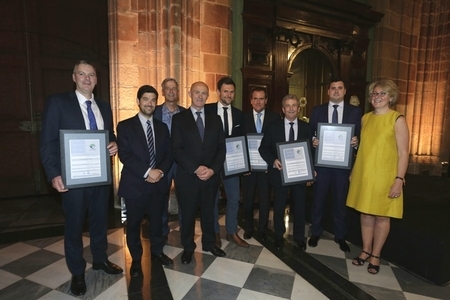 ESPO Secretary General, Isabelle Ryckbost, ESPO Chairman, Eamonn O’Reilly, and Sotiris Raptis, EcoPorts coordinator, handed over the PERS certificates to the ports’ representatives during the ESPO Conference dinner, which took place yesterday evening at Casa Llotja de Mar in Barcelona, Spain. “The number of ports under the EcoPorts network certified with the PERS standard has recently risen to 28 members. This marks the anniversary of 20 years of EcoPorts and further strengthens the network whose primary objective is to assist more European ports to protect the environment, improve public health and address the challenges of climate change”said Sotiris Raptis, EcoPorts coordinator and senior advisor for environment at ESPO.